Posted on March 14th, 2017. Filed under: General News, Room Two News. In our Room 2 learning environment we are dedicated to nurturing our children to become school ready. There are so many important aspects that contribute to becoming school ready. Some are social learning, developing relationships, developing values that make us who we are, learning about respect for ourselves as well as others, learning how to deal with conflict in peaceful and respectful ways while maintaining some social justice. All of these attributes combined make a confident school ready child who learns as many self help skills as possible to feel that they can truly cope with everything. 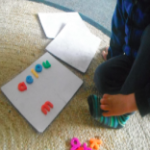 The component that responds to the literacy areas are met through an introduction to the beauty of words, sounds and rhythms that the children learn to identify through simple rules using vowels (that are in every word) and consonants. 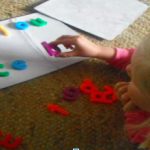 The sounds are in a sequence of cvc (consonant, vowel, consonant) and kept to a maximum of three. 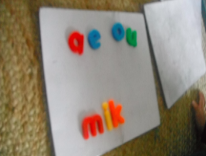 This keeps the vowels as a short vowel sound and the children can manage this relatively well. 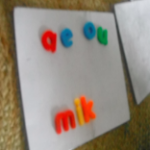 Knowledge of letter sounds will help with future writing and spelling skills as the children navigate the school learning environment. 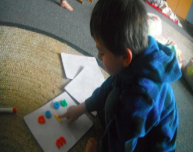 They are also learning about the value of sounds and how they form words. 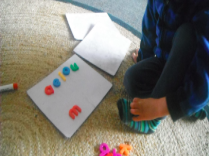 In the photos we are using vowels (the children know them as the helping sounds) to construct their sounds into pseudo words (unknown words that have no meaning). 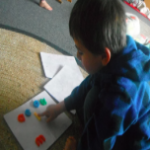 The idea is that they are forming words with their growing knowledge of the concept that sounds (letters) form words. The vowels are used in the middle and the consonants are chosen from a separate pile to form the beginning and end sounds. Sequencing principles are understood by sticking to the rules. 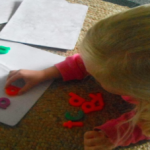 Continuity between Early Childhood Education and School. 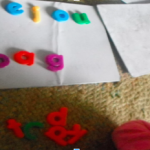 -have language skills for a range of purposes-have considerable experience with books and be rapidly developing secure vocabulary, grammar and syntax. 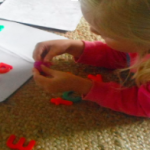 -recognising the distinctive characteristics of book language and be ready to consolidate concepts about print.